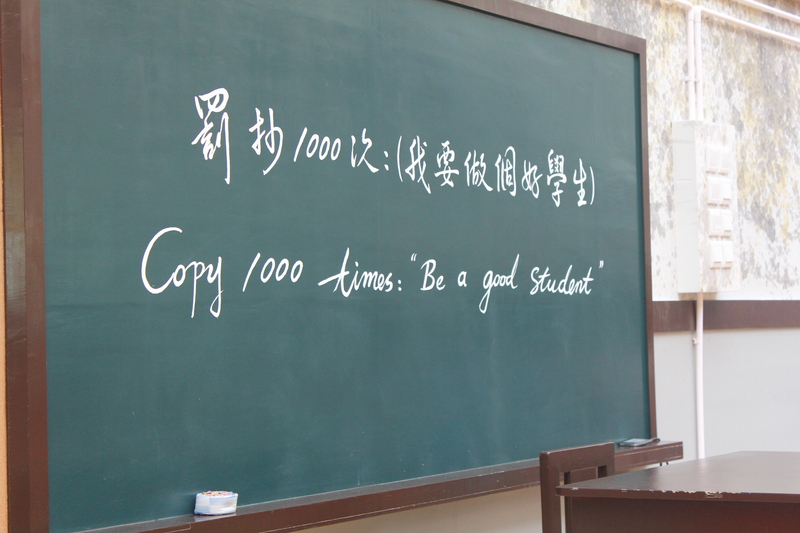 As teachers, the word detention rings a bell with us – oh, how many times (in Korea especially) have we wanted to banish naughty children to a cold, dark room, with a sentence of hours and hours and hours of grueling, preferably unnecessary (other than to teach them a lesson, that is) writing…”Dan-Teacher is your master”, repeat 1000 times. 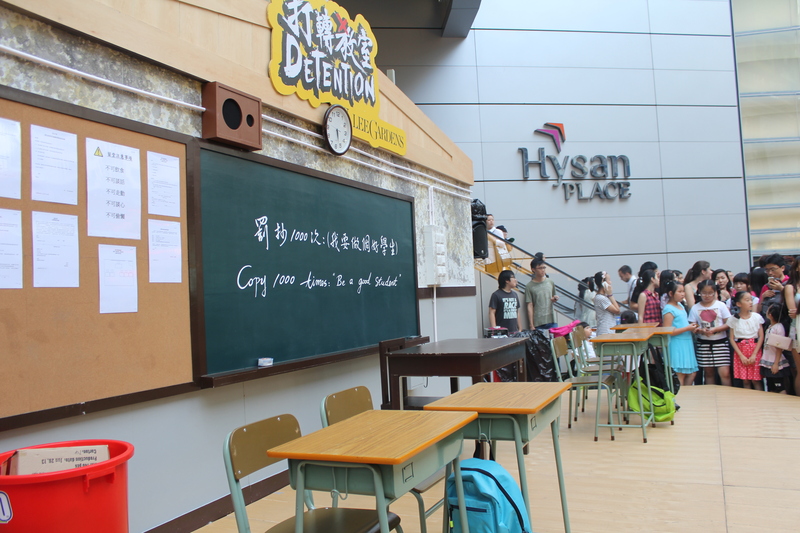 Naturally, with the added bonus of us being total theatre geeks, when we heard about a show called “Detention!” that was being performed here in Hong Kong we looked into it. A non-verbal comedy featuring a mixture of acrobatics, martial arts, Chinese opera movement and percussion? A 5-star review at the Edinburgh Fringe Festival? Award winning athletes and performers? It sounded like our cup of tea for sure. So…we promptly missed the season. Neat. 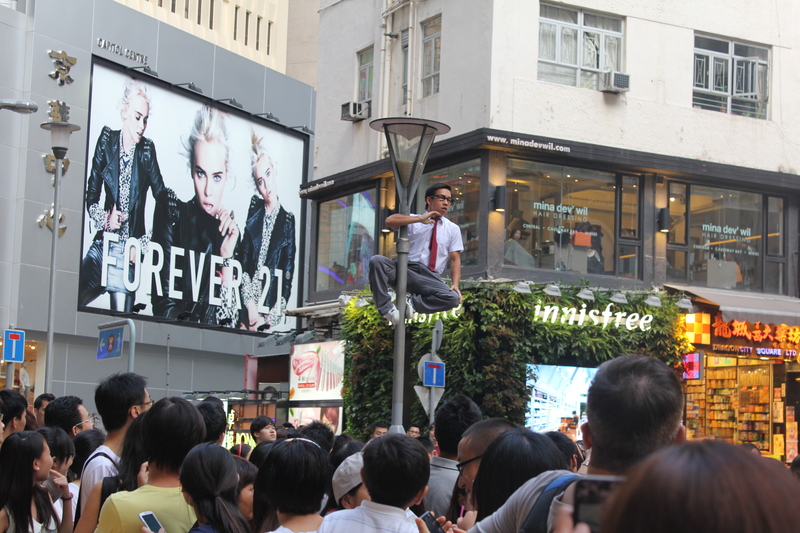 Cut to one day recently when the waterfallsandcaribous team were wandering through the packed streets of Causeway Bay on a sunny Sunday afternoon. Lo and behold, there was a man in school uniform, scaling the heights of a street light. Looking to the ground below, we noticed a stage…school desks…and a growing crowd. 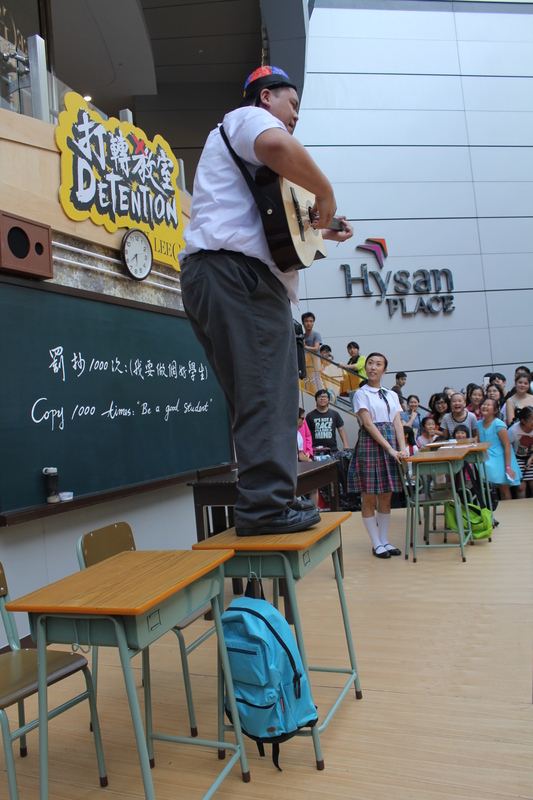 We glided right to the edge of the stage and before we knew it were being treated to a taster of the very show we had missed earlier in the year – Detention! 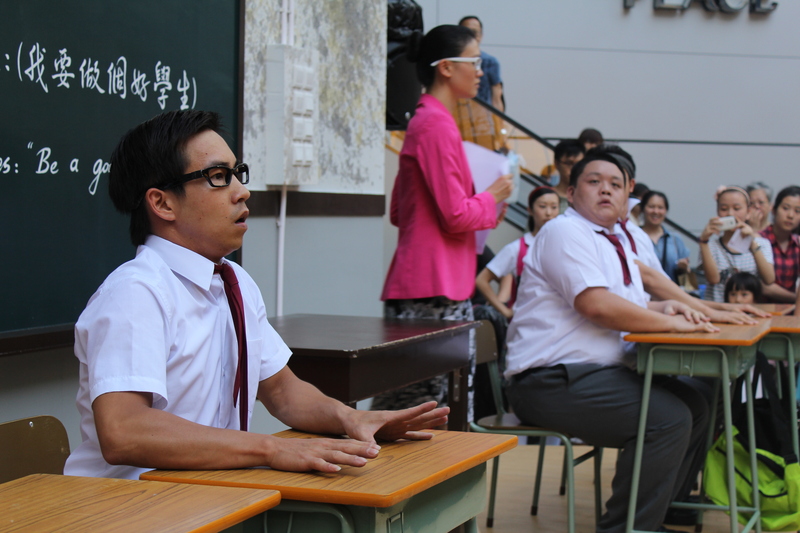 The show is set around an after-school detention session, where three naughty boys are joined by a beautiful classmate, who the boys all hilariously compete over, and a fiery teacher. From what we saw, the full length show promises to be an exciting, physical performance. 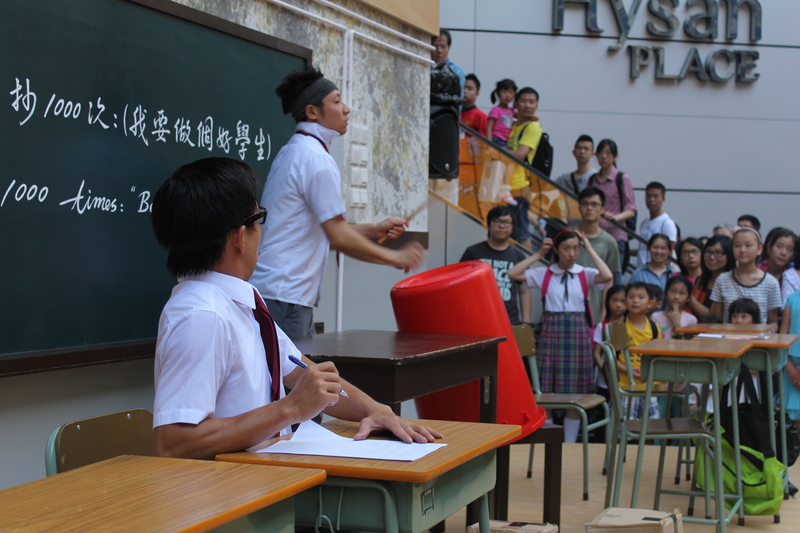 Detention premiered at the Hong Kong Arts Centre to rave reviews in December 2011 and was apparently the first non-verbal physical comedy from Hong Kong to feature this kind of array of artistic mediums. Lucky for us, in their infinite wisdom the troupe have decided to perform another season in Hong Kong. This teaser definitely whet our appetite and after thoroughly enjoying the short snippet we had randomly stumbled upon, we had a chat to the lovely producer and then promptly went home and bought tickets. This time, we will NOT be missing out. The show runs until August 18th and tickets can be bought online at URBTIX or Ticketflap. We’re going to the final show next Sunday, so if you’re in Hong Kong and keen for a pre-show coffee, let us know! Sounds like a show I would love to see. Tell us all a out it. 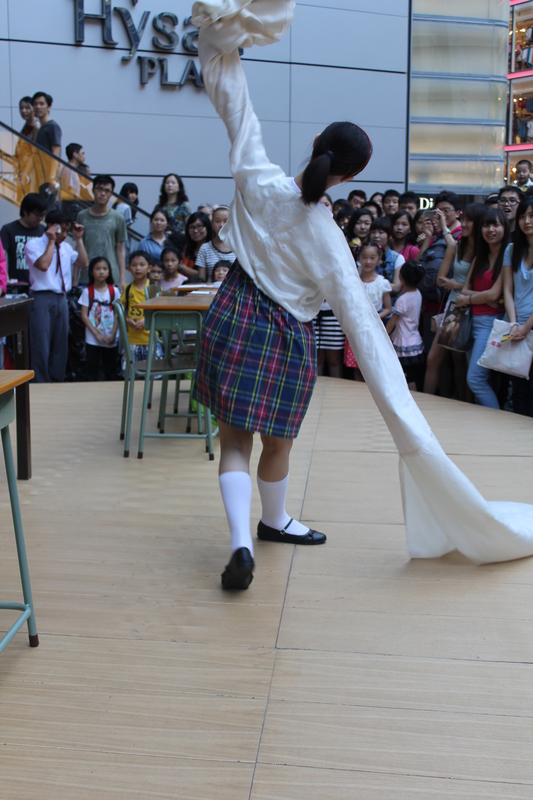 We love us some theatre and we’re excited to dip our toes into the scene here in Hong Kong. From what we can gather its still considered a little bit ‘fringe’ to have physical comedy and the like here so it will definitely be interesting to see what’s what. Looks like fun! I used to love the Ediburgh Fringe Festival – worked there in the summer between finishing school and starting at Uni….what a summmer that was! Ahhh the Edinburgh Fringe Festival 🙂 Touring a show there remains still the absolute highlight of my theatre career! Isn’t it an absolutely incredible buzz?! The irony is that I’m currently ‘taking’ detention. We’re pumped for what should be an awesome show! Hong kong is so happening! Love it!!! Ahhh. And yes those punishments are still quite prevalent in Asia! 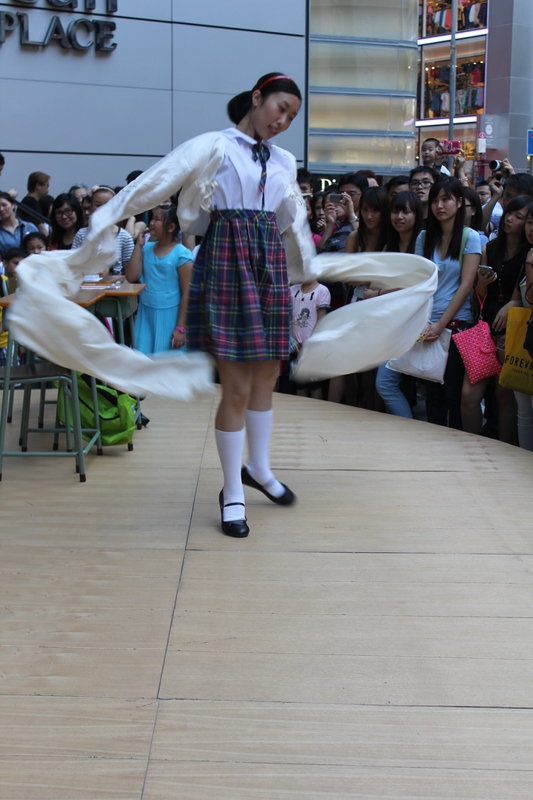 Bwahahaha, love that’ gal student’s sleeves! I really want to see this! She whips out a top that we assume is used in some sort of traditional Chinese dancing and proceeds to…well, Chinese dance, we guess! Very beautiful 🙂 The show was pretty awesome!